It’s been a long few months since the play-off game, but I’m re-posting this in honor of the Kansas City Chiefs Training Camp starting in St. Joseph this week! Being single definitely poses some financial challenges. A recent Wall Street Journal article explores three things that can help single people retire well. Is an annuity really suitable for me? Is it possible to make money without taking on risk? How can I legally give up a wallet-draining time share? 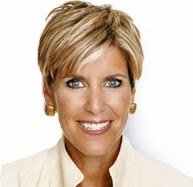 Read Suze Orman's responses here. When I bought my last car, I faced a dilemma. At a critical point, I discovered that I liked the car a lot, but not the dealership. I had to choose: give up the car, or buy from a dealer I didn’t like. Other people face the opposite problem. They like a particular dealership but aren’t happy with available brand names or models. They’d prefer a different car, but they want to buy it through their chosen dealer. With cars, maybe you rely on a salesperson to answer technical questions, arrange test-drives, and help with the financing. You trust them to help you reach the right decision, sign necessary papers, and – hopefully – you go home happy. What if you learned afterward that the salesperson earned special “incentives” all along the way? That the car you bought paid higher sales commissions (and cost more) than others? That your lender awarded paid vacation to sellers closing the most “deals?” Ultimately, you may have overpaid for the car and missed better financing opportunities. Would this upset you? One solution might be a car “supermarket” – featuring multiple product lines through one dealer. You could get any vehicle you want through the same local dealership. Salespeople would be salaried, or at least they’d disclose how they are paid on every car. Then, you could reach truly informed decisions. The compensation system is the problem. Behavior is often motivated by the way people are paid. Today, dealers sell the models they’re allowed (limited by the manufacturer) and salespeople sell easy options or those offering greater personal reward. For the consumer, it’s a dangerous system. Family Investment Center exists to avoid similar problems in the investment industry. We don’t earn sales commissions or transaction fees. We help clients choose between thousands of investment options (no captive funds); there’s no financial incentive to recommend one choice over another. Our financial rewards are tied directly to long-term customer satisfaction. Dan Danford, Founder and Chief Executive Officer of Family Investment Center, takes a "back to basics" financial advice approach with this week's episode of Money Made Easy. Dan is frequently approached by people wanting to know the difference between savings and investing. In this video, he explains three reasons to invest and why savings alone will not allow you to meet your financial objectives.